Toyota Corona T80, T90. Luces de cola original Koito Toyota trasero luces izquierdas y derecha con marco cromado. Einbauposition Rechts. Einbauposition Links. Einbauposition Hinten. Cargos pueden aplicar. 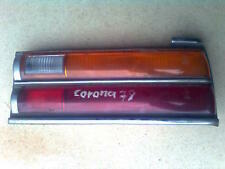 TOYOTA CORONA EX ST190 CARINA FRONT INDICATOR LIGHT. GENUINE TOYOTA PART. READY TO FIT. O/S DRIVERS - RIGHT SIDE. PART NUMBER: 81610-20530. Headlamp for Toyota Corona / Carina 2. Happy to help. Gebrauchte Rückleuchte rechts. Mit Lampenträger. Passend für Toyota Corona T130 CS 1978-1982. Dies hat keinerlei Auswirkungen auf die Rechte zwischen dem Käufer und uns. Gebrauchte Rückleuchte links. Mit Lampenträger. Passend für Toyota Corona T130 CS 1978-1982. Dies hat keinerlei Auswirkungen auf die Rechte zwischen dem Käufer und uns. LUCAS FRONT INDICATOR. TOYOTA CORONA. LEFT HAND SIDE. Toyota Corona 1994-1997 Luz De La Cola Derecho O/S/R nuevo reemplazo. TOYOTA CORONA 1994-1997 TAIL RH LIGHT O/S/. This part was removed from a Right Hand Drive Vehicle. Compatibility is a guide only. Your item will need to be signed for. Other Details. TRIM LEVEL. Part Number. Toyota Camry 2006. Toyota Estima 2006. Toyota Corona 2003. 2 faros completos (24 SMD LED - Cortesía, reposapiés, Side, debajo de la puerta). Color: hielo 6500k blanco. Reference OE/OEM Number Puddle Step Interior Courtesy. Toyota Celica 1976-1981. Toyota Corona 1972-1978. Toyota Corona MKII 1974-1976. Toyota Supra 1979-1981. esto encaja. Esto agilizará el crédito a su cuenta, si procede. Nos esforzamos para asegurar que proporcionamos calidad superior y piezas correcto para cualquier aplicación. ORIGINAL TOYOTA Blinker Blinkleuchte VORNE LINKS. Neuteil, wie abgebildet. Toyota Corona Premio. Matt headlights present a serious safety risk. In addition, naturally, clear and well maintained headlights also contribute to the appearance of the vehicle and, thus, the value retention. 1979-1982 Toyota Corona Wagon. Viene con una garantía de 30 días. Other Part Number 27427GG54. Warranty Yes. Artículos deben devolverse en las mismas condiciones que compró. Ninguna política de devolución de problemas . Rectángulo Niebla Spot Lámparas Para Toyota Corona Luces Principales Haz Completo Extra. Toyota Corona. TheRing Rectangular Fog Lights are slim-line lights for bumper or spoiler mount. They are easy to fit and include halogen bulbs and brackets. Ring Rectangular Fog Lights Extra Info. Ring Rectangular Fog Lights. TOYOTA Corona Premio. Kit de Restauración Faro. Características y ventajas Faro Polaco Utilizando el kit de restauración de faros QUIXX, mates y amarillentas luces son restaurados otra vez como nuevo! A pair of New Style Quality Ring Automotive UK Spot Lamps, Designed and Manufactured in the UK For mounting above or below the bumper, complete with 2 x 12 volt 55 watt H3 'E' approved powerful Halogen bulbs. Perfect for the Winter Nights, Made from top Quality high impact ABS so will not Rust ---Fully 'E' approved ---2 x 6" Round Driving Spot Lamps ---2 x 12V 55W H3 'E' approved powerful Halogen bulbs (Fitted) ---H160 x W160 x D70mm --- Basic Mounting Brackets & Instructions We also stock these with a Fog lens and also in a rectangle style. A wiring kit can also be brought separately. Toyota Corona. Toyota Corona T80 T90. Diese Kosten sind vom Käufer zu tragen. Wird verkauft wie auf den Fotos abgebildet ist! Baujahr 1970-1973. Koito 53-03402R und 53-03402L.